The Bible Jigsaw Puzzle - Website of reckersworld! Perhaps you’ve heard arguments like this from self-righteous Christians? The natural man “does not accept the things that come from the Spirit of God, for they are foolishness to him, and he cannot understand them, because they are spiritually discerned” (1 Cor. 2:14). The problem with this scripture is it makes a very serious assumption. It assumes that not accepting things that come from the spirit of God is a result of not understanding. What a fallacy! What about those who understand, but disagree with it? What about those who DID understand but have now come to reject it? It also assumes that “thinking something is foolish” and “misunderstanding” goes hand in hand. Is it not possible to understand something and still see it as foolish? It's very badly worded and presumptuous scripture and I'm surprised that any intelligent all-knowing God would sign his name to such a fallacious argument. (All though, clearly it’s a statement made by some biased and self-righteous human) Furthermore, it’s quite obvious to anyone who has spent a number of years in churches and spent many, many hours studying the bible that it has nothing to do with understanding. It all comes down to the ability to twist and turn scripture into something that puts God in a positive light or that backs up your particular brand of belief. You can come up with almost any philosophy and find a scripture to back it up, which is why there are so many thousands of denominations of Christianity. You can also take a scripture and look at it from various different perspectives, thus coming up with completely different meaning to someone else. If you’re really clever you’ll even find other scriptures that when read in conjunction with your first scripture, paint an entirely different picture of the text. It’s easy and the winner is the person who can come up with the most impressive, most convincing arguments. Many Christians claim that the bible is a gigantic jigsaw puzzle. It is a portrait painted by an amazing artist. The books of the bible are like different parts of the puzzle, but they all fit together. Even when you have one piece that doesn’t seem to fit, it doesn’t matter. Somehow, it will all fit together once you’ve spent enough time placing the pieces. However, anyone who has been piecing this puzzle together for a number of years will start to see that a lot of the pieces can be placed in many different ways, thus showing conflicting images. Many people will proudly display their completed puzzle showing how they have fitted the pieces together but their image will show an entirely different picture to what another person will have. Of course, they will both claim they have the pieces fitted together perfectly. This solver will force pieces together that don’t really fit. They will insist they fit anyway, refusing to accept the fact they belong elsewhere in the puzzle. They will be in denial of the fact that the images don’t really quite meld. You can imagine a child with his Rubicks cube, who pulls the cube apart and then pieces it back together so all the colours are on the right sides. This puzzle solver is like the Christian who tries to manipulate a scripture by trying to connect it with a different scripture somewhere else in the bible, so that it gets a different meaning AND so that you can't call it out as a load of BS. "Yes, in John 14:13 it does say whatever you ask for you shall recieve but in James 4:3 it tells you you will only get what you ask for if you have the right motives"
This solver will actually repaint some of the images on the pieces so as to make it look as though the pieces belong there, even though they may not actually fit. You can imagine the child with his Rubick’s Cube who pulls all the stickers off the cube and replaces them so that all the colours are on the right sides. This is like the Christian who changes the meanings of words so that they can change the meaning of the scripture they’re looking at. "Sure, that's what that word means, but if you go back to the original Hebrew word it also means..."
This puzzle solver actually cuts and resizes the pieces so they will fit. You can imagine the child with his Rubick’s Cube who instead of finishing the puzzle the way it was intended, just prefers to create patterns instead. This is like the Christian who uses his imagination to come up with other meanings of scriptures. He will manipulate the words to get a different meaning to what they really are. He will often sound impressive because he has come up with something you never thought about before and it may just actually make sense. "When Matt 24:34 says "this generation" will not pass it's actually talking about the future generation who will be witnessing the end time events!" This puzzle solver will actually create his own pieces, ones he can add to the puzzle so he can connect other pieces together. This is like the Christian who comes up with wild things that have no biblical basis at all, but sometimes actually sound impressive and seem to make sense. "God exists in a dimension of timelessness." This puzzle solver will do the puzzle in sections. They’ll do a section here and a section there, but keep them separate. They will insist that it’s all one picture, but refuse to join it all up, because they either tried to before and it didn’t work, or they just don’t want to face the fact it’s not one big picture. You can imagine the child with his Rubick’s Cube who tries to solve the puzzle doing one side at a time, rather than by layer and inevitably never manages to solve it. This is like the Christian who refuses to look at the bible as a whole and refuses to acknowledge that one part of the bible conflicts with another part. So instead of attempting to put the sections together, they’d rather remain in denial and just deal with each section as an individual picture. These Christians will come up with something one minute and then a short while later come up with something else, which contradicts what they first said. "1 Cor 13:5 says love keeps no records of wrong doings"
"Rev 20:12 says you will be judged according to what you have done as recorded in the books"
This puzzle solver only does so much of the puzzle before they give up and let someone else finish it off. They will then proudly display what is done of their puzzle, insinuating it is their handiwork. This is like the Christian who realises they just can’t figure out scripture on their own, so they rely on others to interpret it for them and tell them what it means. They will take that knowledge and spread it on to others, but will never think too critically about any of it and just accept it as the truth. "Today at church the pastor taught us that..."
This puzzle solver will actually throw pieces of the puzzle away if they see something they don’t like the looks of. 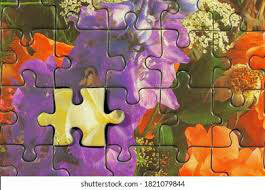 He’d rather have sections of the puzzle incomplete, rather than even attempt to fit them together. This is like the Christian who sees the many problems within scripture, things that make the bible look bad, ignorant or just plain stupid. They will pick and choose which parts they believe and reject anything that doesn’t add up to their preconceived ideas. They will even treat quoting scripture as some kind of card game and use one scripture in an attempt to trump another scripture without even trying to analyse the scripture which was first presented. 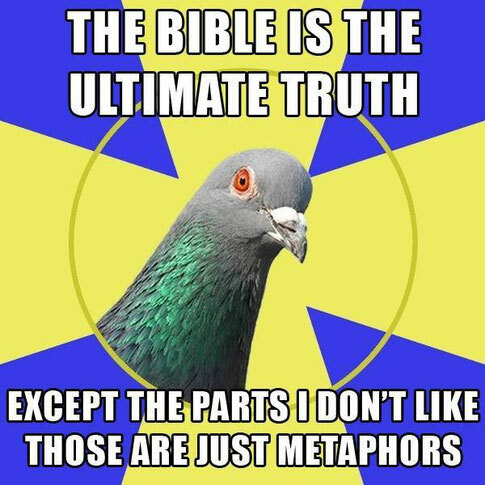 Some Christians will even reject the Old Testament simply to avoid having to face what it says. "The scripture may say that, but another scripture says THIS..."
"Oh, that's the old testament. We don't have to be concerned with that anymore." You will see that these are the standard methods used by Christians to complete their puzzle. Some may use a combination of the above techniques. There is normally not any intended deception here, but the Christian is adamant it’s one big picture, so will fit the pieces together the best way they can. One who has been doing the jigsaw puzzle long enough may begin to wonder… Perhaps this jigsaw puzzle isn’t all it’s cracked up to be? Why do people put it together differently? Why can’t even two people come up with the same overall picture? It just never happens even though many claim to have the great Holy Puzzle Solver (the Holy Spirit) guiding them. Once you open your eyes, once you really take a look at this so-called jigsaw puzzle without the Christian glasses, you will discover it isn’t one gigantic puzzle. It’s a whole heap of smaller puzzles, all of the same scene, but all drawn by different artists who have painted the scene through different perspectives and with differing styles. The Christians who are best at deciphering the bible are the ones who can best cut, shape and re-colour bits and pieces to give an overall picture. Some of their pictures actually look ok, and look like they may be the genuine article. But then some come up with an abstract mess. Clearly, it’s futile to take a whole lot of pieces from different jigsaw puzzles and try to force them together to get one big picture. It just doesn’t work and only looks good to the person who is forcing the pieces to fit. The average Christian, throughout their life will continually rearrange the pieces to attempt to get a better picture. In other words, they will change their beliefs and views as more convincing arguments come their way. They will become more and more adept at altering the pieces to make them fit. They will become more skilled at the shucking and jiving that’s needed to defend scripture. All these people will claim they have the Holy Spirit guiding them, but yet their views will continue to change and the understanding they claim to have will clash with other Christians who also claim to have Holy Spirit understanding. Nevertheless, you will notice something about the ones who are best at debating their points. In most cases, they are the far better educated people.